Zaria is a Redguard who immigrated to Skyrim in order to explore her passion for poisons more freely. She fell in love with Falkreath and named her store Grave Concoctions, where she also lives. She wakes up at 8am and opens her store. During this time, she can sometimes be found mixing some potions behind the counter. At 8pm she closes her store and spends the evening relaxing until midnight, when she heads to bed. She wears a set of merchant clothes, a pair of boots, and a hat. She is equipped with an iron dagger, and carries a key to her store, and a selection of common items and gold. When approached, Zaria will greet you with things like "Someone new, perhaps someone looking for me to mix something up for them? ", "Don't let the shop's name frighten you away. I have plenty of reliable tonics and healing potions to sell. ", "Falkreath's warriors always return, one way or another. ", and "If either these Nords or Imperials had some red in their blood this war would be over." When you are browsing her store, she may politely say, "Call upon me if I can be of any service." or "Browse as much as you like, please." If you ask her why she named her store as such, she will give you an explanation: "I know it's a bit strange. Not exactly a name to bring comfort to the sick and ailing who come to buy a poultice or salve. But what you must understand about Falkreath is that our town is defined, for better or wrose [sic], by the large and ancient cemetery here. That's why the inn is called Dead Man's Drink, the farm is called Corpselight Farm, and so on. I suppose it's sort of a running joke." Asking her what brought her here will have her reply, "Well, my family back in Hammerfell didn't approve of my interest in lethal poisons and death in general. So I left, and wandered north. When I found this town, with its huge cemetery, I felt right at home. I opened the shop and I've never looked back. This is where I belong." Zaria is a member of the warrior class, which determines the level of her skills. Zaria was once intended to work at Bolund's mill, indicated by her belonging to the lumberjack faction and her unused dialogue below. 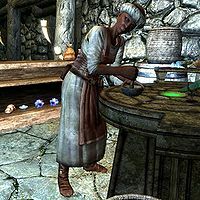 Zaria was also once intended to serve as housecarl, presumably after the Stormcloaks took Falkreath, as she is in the housecarl faction, still has an unused package to exile her to Windhelm, and is marked as the backup housecarl in Falkreath's dialogue quest. Zaria and her store also appear in Legends. Zaria may attack you on sight if you have accepted Kematu's offer to lure Saadia to the Whiterun stables during the quest In My Time Of Need. After this quest has been completed she will return back to her non-hostile behavior. ? Zaria's store cannot be invested in with the Investor perk. This page was last modified on 22 May 2018, at 18:17.